Black fps then immediate fatal error and crash. Goes in-game as you can see below. Game is fully playable from start to finish with some minor visual and audio bugs. Visual Bugs: Both "Down the Tubes" and "Tube Race" have this visual bug (probably becouse it has a wave effect on the screen) and the main character's sprite is bugged during the whole game. Audio bugs: Audio just cuts off after playing the game for some time. It's opening a black window and then close. And if you turn off "Use GPU texture scaling" then the only bug will be the main character. Try disable vertex cache and strict rendering mode. (07-25-2018, 10:57 AM)Asinine Wrote: Try disable vertex cache and strict rendering mode. I tried everything but no luck. 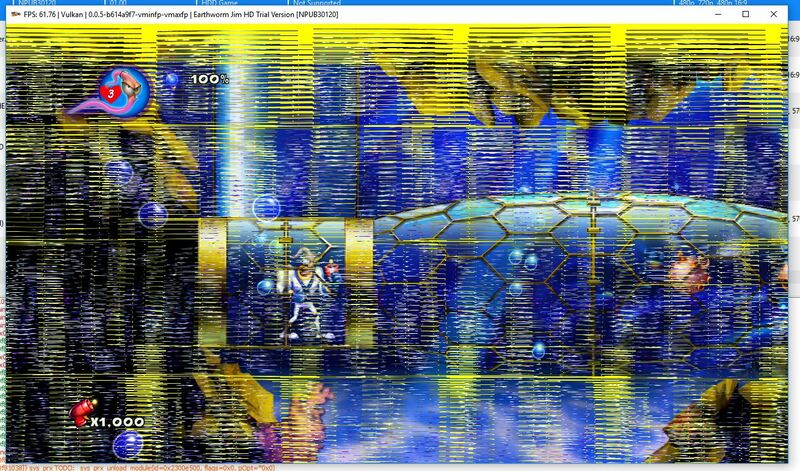 But after beating this level and replaying it glitch was no longer there. Keep in mind before beating level when glitch happened I tried restarting Emulator many times but no luck. Also part 2 of same level is even worse. No such graphical glitches but background of level is in front of the level which made level super hard to beat especially due to time limit. Restarting emulator fixed it this time for this level.